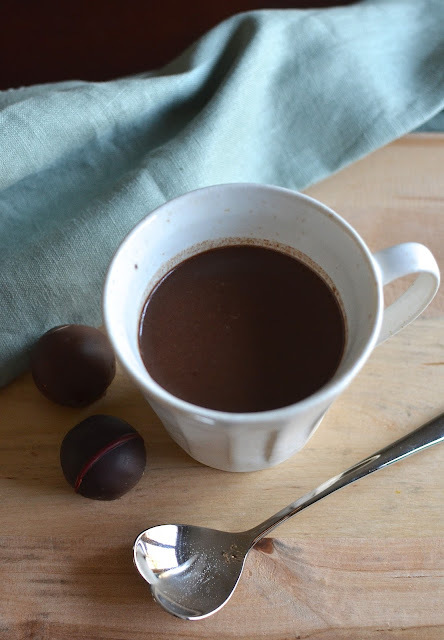 A while ago, I saw a recipe from Cooking Light for "Barcelona hot chocolate". I've never been to Barcelona and I wasn't familiar with the drink but, apparently, it refers to the combination of hot chocolate and espresso (or coffee) that's popular in Spain and Europe. Well, as a girl who makes herself a mocha frappucino almost every morning, I was definitely interested in this combination. In fact, I've also tried stirring cocoa powder into my hot coffee but could never quite get the ratio right. Since it is most definitely hot chocolate season, my Christmas mugs and cocoa-making equipment have been out and in use. And because I couldn't really stop thinking about this Barcelona hot chocolate, I decided to give this somewhat more grown-up version of hot chocolate a try and I am really happy I did! This recipe definitely has the ratios right, in my opinion. It starts with making some delicious hot chocolate with a little bit of bittersweet chocolate, melted down with water, a couple spoonfuls of cocoa powder, and mixed with 1% low-fat milk. The coffee (or espresso; I choose strong coffee) comes next, followed by some sweetness from a couple tablespoons of brown sugar. 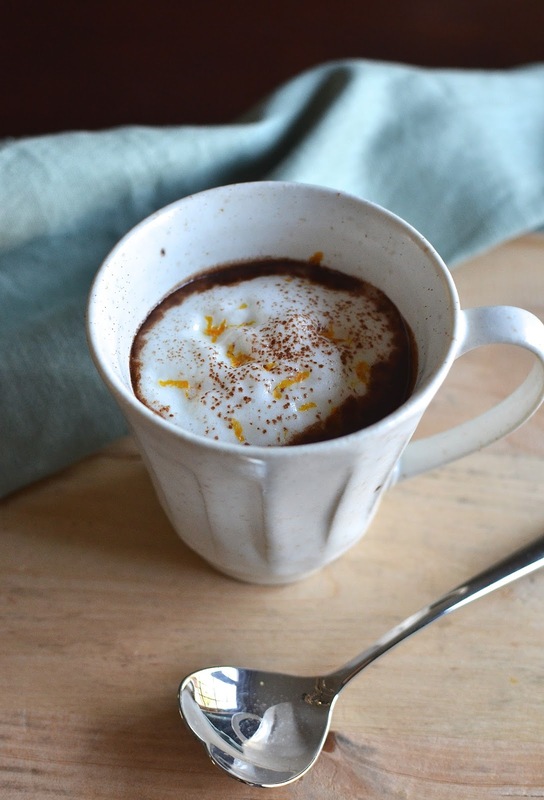 That's not it...add a strip of orange rind and after about 5 minutes on the stovetop, you have this rich, full-flavored hot chocolate-coffee concoction that's infused with orange flavor! It was a very pleasant surprise. I topped my cups of Barcelona hot chocolate with some milk foam, latte style. I have a very inexpensive handheld milk frother that does a very good and quick job of frothing up some warm milk. I ladled a bit on top, dusted some cocoa powder over it, and added a little bit of orange zest to give you an idea of what's in the drink. It's so, so good. You have rich hot chocolate, not overly sweet, blended with deep notes from coffee and made even more interesting and delicious with the orange flavor. If this appeals to you, do give it a try! The combination of chocolate and coffee is a wonderful thing. For me, the orange in this drink was a bonus and I was amazed by how much orange flavor the drink had with just a small strip of orange rind. You could splash in a little orange liqueur for even more oomph but I'm almost glad I didn't because it really didn't need it. It will sound strange but it tasted almost like it had a splash of Grand Marnier in it already! If you don't like orange with chocolate, you could omit the orange rind and leave it plain, or add other liqueurs to your liking to make things interesting. I think the base recipe for this hot chocolate and coffee combination is a great balance that you can play with. As you can see, the drink is dark and rich. I think the brown sugar works really well in deepening the flavors. You could top the drink with classic whipped cream but I'm really glad I was out of cream and bypassed the ready-made stuff in the canister for some milk foam. It adds just a nice little extra creaminess and sweetness without being overpowering. Have I convinced you to try this yet? Regardless, I hope you enjoy a few good mugs of hot chocolate/cocoa this holiday season. Generally, I try not to drink all my calories but I'm willing to trade a few of my morning mocha fraps for this, particularly during the holiday season. It will fortify you and make you ready to tackle that pile of Christmas presents that need to be wrapped! Place boiling water and chocolate into a small saucepan over medium-low heat and stir together until chocolate melts. Add milk, espresso or coffee, cocoa powder, sugar, and the orange rind. Cook, over medium-low heat, stirring gently with a whisk. Heat for about 5 minutes, until tiny bubbles begin to form around the edges of the pan, stirring frequently (do not boil). Discard orange rind and distribute the hot chocolate between 2 cups. 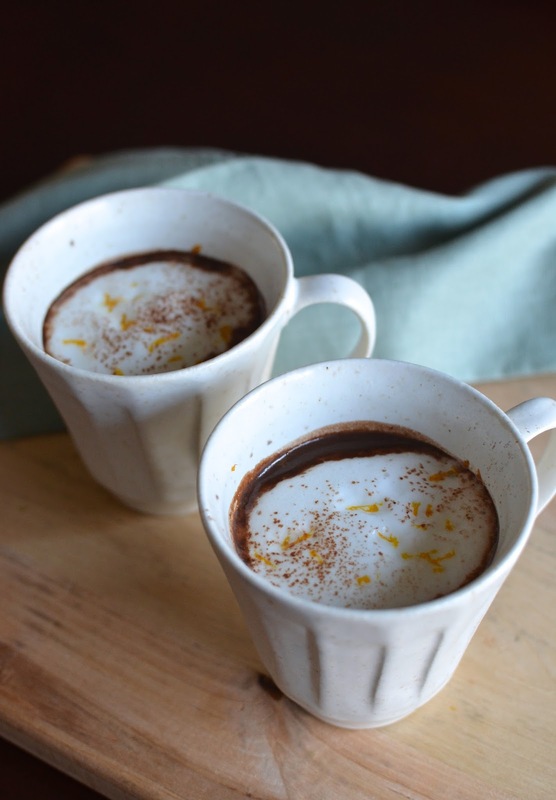 Serving suggestion: Top each cup of hot chocolate with milk foam, dust lightly with cocoa powder and add a sprinkle of fresh orange zest. * To make milk foam, I place a few tablespoons of whole milk (low-fat milk also works) in a glass and warm it in the microwave. Froth the milk with a handheld electric frother and spoon some of the foam over the top of your drink. One more thing before I go...do you like to top your hot chocolate with marshmallows? I'd generally answer 'no' to that question but I've had this urge to top a cup with some toasted marshmallows. I must be looking for ways to put my little kitchen blow torch to use! So while my husband and I were enjoying our Barcelona hot chocolates, the little guy had a regular cup with some rather toasty marshmallows. However you like to enjoy your cup of cocoa...Happy hot chocolate season! Oh yum! Monica, now I am craving hot chocolate — Love this version! Such an interesting and delicious ingredient choice! Mmmmm, so yummy! It turned out super delicious, Anu. Thank you. Mmm this is right up my alley. Sounds like the perfect Friday night "it's too cold to go out" drink! It's a great pick-me-up for sure, especially during the holiday season. Looks so good with caramelized marshmallows! This chocolate sounds so nice and warming.. yummy! I love a real cup of hot chocolate and can't wait for the next snow to try the addition of orange too. Love your frothy milk topping and the cocoa and the toasted marshmallow - what a fun project / dessert! Maybe some coffee Kalhua - yummy! I loved the orange in this...but a splash of Grand Marnier in its place would do the trick. Kahlua sounds great, too. So many possibilities! Not at all, Wendy. I often either use a mix, or leftover ganache, or just cocoa and 'wing it'. It's all good...that's why I was a little reluctant to follow a recipe but I'm so glad I tried this. It is so flavorful...hope you like it, too! PS- orange chicken sounds wonderful for dinner! Oh my, Wendy! I know you and your family are happy if you are eating this tonight. I think I was drooling when I clicked over and saw it...can't resist the sauce! My husband and I have been saying we can't believe how hooked we've become to our cup of joe! This is a treat. Oh. my. word. Trying this immediately! I've never heard of Barcelona hot chocolate either, but I'm so glad I have now! I was thinking of calling it something else because I have no idea if Barcelona hot chocolate is a 'thing' but I'll trust the pros and leave it alone. : ) So glad it appeals to you. It was so good! Oh my gosh I need to try this asap!! I love the idea of adding some orange liqueur, too! All my mugs are out and I am so ready to try this hot chocolate! I've never tried it before but it sounds sensational! I love the hint of orange with dark chocolate! I love the idea of adding orange - what a fabulous flavour! Hi Beth, I really loved that orange component! This is a great recipe with the orange rind and my kids would love love the marshmallows. That looks like a warm cozy mug my dear. Thanks, Asha. I'm looking forward to making it again one weekend soon. Take care now. Growing up in Barcelona i can tell you this is the best kind of hot chocolate! I've never had it with orange rind...sounds delicious! Thank you, thank you! : ) I am so lucky to hear from someone in the position to know. For some reason, I wasn't sure if Barcelona hot chocolate was an actual 'thing' though I'm sure the combination of espresso/coffee with hot chocolate is well loved. The orange in the background was really lovely. Thanks again for the comment. YUM!I'd die to have it right now! : ) It's a great pick me up, that's for sure, Marcela. Sounds delicious! Like a mocha, except better ;) Love the idea of orange infusion in the drink! Exactly. I am craving another cup really badly myself. Thanks so much, Rita. Hope you try it out. I have made this for my mother-in-law and me yesterday. We LOOOOVED it!! Adina, I made this for Christmas morning (so good :) and realized I'd omitted the cocoa and sugar from the instruction. So sorry and hope it didn't throw you off too much. I've now edited the recipe. Hope you had a great Christmas! Yikes, sorry for the inconvenience, Adina! I definitely recommend the cocoa and the drink does come out sweet so if you decide to add the brown sugar, start with just half the amount. : ) Thanks again!